Transaction Structure – Total consideration consisting of $400.0MM in cash, 10.0MM shares of common stock in Pacific Energy valued at $25.5MM and a seven year seller note to Forest with a net present value of US$30.0MM. Fairness Opinion – ECS provided its opinion (the “Fairness Opinion”) to the Board of Directors of the Company as to the fairness of the consideration to be paid by the stockholders of Pacific Energy in connection with the transaction from a financial point of view. 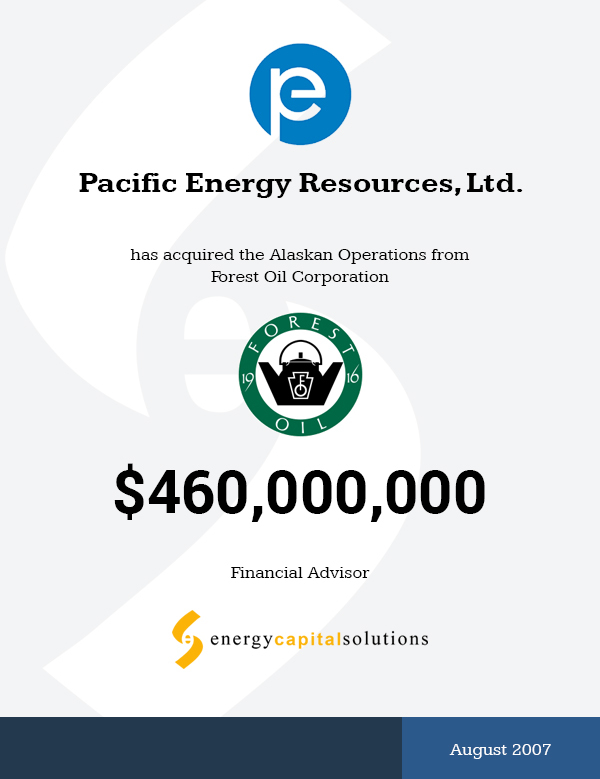 March 9, 2007 – ECS was engaged by Pacific Energy Resources Ltd. (“Pacific Energy” or the “Company”) as its exclusive financial advisor to advise the Company on the acquisition of Forest Alaska Operating, LLC (“FAO LLC”) and Forest’s Other Alaskan Assets (“FOC Assets”) (combined “Forest Alaska”) and raise the financing necessary to complete the acquisition. May 15-22, 2007 – Pacific Energy and ECS negotiated the purchase and sale agreements (“PSA”) with Forest Oil and executed the PSA on May 22, 2007 for an anticipated total consideration of $460.0MM. Strong Financial Sponsorship – The Company’s existing lenders, Silver Point Finance, LLC and Goldman Sachs & Co., were approached by ECS and Pacific Energy to provide a $425.0MM bridge loan to finance the transaction and provide additional working capital for development. transaction which strategically positioned Pacific Energy to be chosen as the winning bidder. Energy Capital Solutions, LLC (ECS) is an investment bank focused on providing capital raising and M&A advisory services to public and private energy companies. ECS is a licensed broker-dealer and a member of the FINRA and SIPC. Copyright © 2019 energycapitalsolutions. All rights reserved.